From 1839 to 1840 Anne worked as a governess to the Ingham family at Blake Hall, Mirfield. From 1840 to 1845 she works for the Robinson family at Thorp Green York, she takes her first trips to Scarborough with them in the summer vacation. In May 1846 under the Pseudonym of Currer Ellis and Acton Bell, a book of Poems was published, Anne contributed 21 poems. In July 1847, the publishers; Thomas. Cautley. Newby accept Agnes Grey which is published the following December. 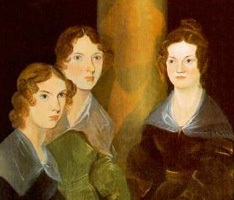 In July 1848 Anne completes her novel The Tenant of Wildfell Hall. In January 1849 Anne is diagnosed with tuberculosis, on the 24th May 1849 Charlotte Anne and Ellen Nussey leave for Scarborough, in a hope the sea air might alleviate the Anne's symptoms. On 28th May 1849 Anne Bronte died at 2 o'clock in the afternoon aged 29 at Scarborough. She was buried in St Mary's churchyard on Castle Hill overlooking the bay.